* SQUEEGEE: This is small tool used to help apply your stickers. * COLOUR: This is the colour of the sticker vinyl. * NUMBER: This is your house number (up to 4 numbers). You will receive 3 individual stickers, 1 Large, 1 Medium, 1 Small. Ideal for your wheelie bin, recycling container, and waste bin. All the great wheelie bin sticker numbers we manufacture here at mywheeliebin.com are made from the highest quality adhesive outdoor vinyl which is washable and hard wearing. 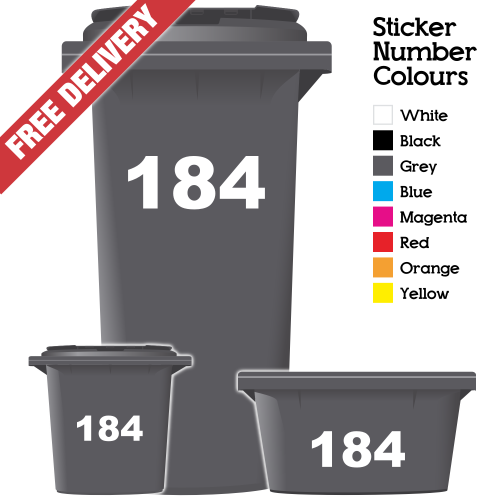 Our wheelie bin stickers are contour cut to size so there is no need to get the scissors out! Easy to fit and suitable for any flat or slightly curved surface, even if it's not your bin! All our wheelie bin stickers are easily removable, so should you wish to change sticker designs or remove the sticker, simply heat the stickers slightly with a hairdryer or similar and peel away without damaging your bin. 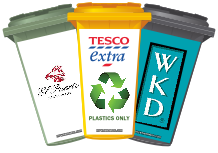 Our Wheelie bin stickers and wheelie bin sticker panels are the perfect way to transform your boring old wheelie bins and are also great as a gift. 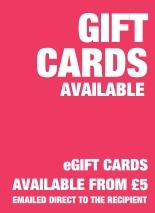 mywheeliebin.com - Brightening up Britain one bin at a time! Due to the number of local authorities supplying different size bins to house holders, we offer wheelie bin sticker panels in a variety of sizes. We do this so that the wheelie bin sticker panel you choose will fit nicely onto your wheelie bin without the need for you to get out the scissors! Below is a list of the most popular size wheelie bins and the size sticker panel that is the correct fit for it. *All size are approximate and for guidance only. Please note that the wheelie bin sticker panel image may show a little less or more of the image than is displayed on the coloured bin example images shown at the top of this page. This is simply because the sticker image needs to be scaled differently (up or down) for it to fit the different size bins​. Clean and dry the surface you plan on placing the sticker panel to. This will get rid of any dirt or grease. Now, wet the surface you plan on placing the sticker on with soapy water. 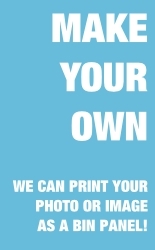 You will need to have a wet surface in order to manoeuvre the sticker around and into place. If the surface is too dry, the sticker will immediately stick to the bin and you will not be able to reposition the sticker if required. Visually position the sticker panel in the desired location on the bin, then remove approximately 10cm of the backing paper evenly across the top and lightly apply the exposed sticker to the bin’s surface. Stand back and check if it is level (if not remove the sticker and reposition). Make sure the surface of the bin is still wet. Once the sticker is applied at the top, remove the backing paper entirely. Firmly hold the base of the sticker with one hand slightly out from the bin so the adhesive is not yet touching. Using the edge of a felt squeegee apply even pressure by pushing left to right continuing downwards until the sticker is fully applied from top to bottom. IMPORTANT! Push all air bubbles out to the nearest exposed edge and squeegee out any excess water. Air bubbles could cause the sticker to crack over time and excess water can stop the adhesive from curing. 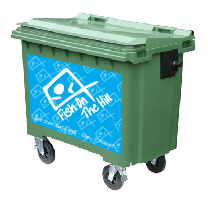 All that’s left to do now is to proudly park your new mywheeliebin.com bin in the street next collection day! This Pack of 3 stickers contains 1 sticker of each size: Large: 210 x 210mm .. This Pack of 3 stickers contains 1 sticker of each size: Large: 210 x 120mm | Medium:.. This Pack of 3 stickers contains 1 sticker of each size: Large: 210 x 210mm | Me.. This Pack of 6 stickers contains 2 stickers of each size: Large:116mm High .. 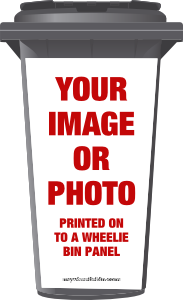 This Pack of 3 stickers contains 1 sticker of each size: Large: 220 x 140mm ..